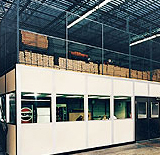 At PortaFab, we realize that different applications require totally different structural mezzanines. 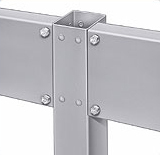 For light duty applications, our C Channel system is one of the most cost effective solutions on the market while our Type 3 Connection sets the standard for strength, durability, and stability. If offices are part of the plan, you can save by using one of PortaFab's load-bearing modular wall systems. 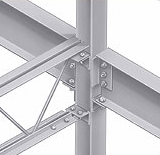 An economical alternative for projects requiring large spans, open web bar joists are a proven structural component widely used in construction. They simplify the installation of sprinkler systems, electrical conduit, and mechanical equipment. One of the most cost effective ways to add both storage and office space is to utilize one of PortaFab's load bearing modular wall systems. The OmniFlex, for instance, can be outfitted with load-bearing roof beams that can accommodate mezzanine floors.